Below is a list starting with Sahu showing the Tai Chi linage. Sifu Michael Jacques has practised Tai Chi for over 25 years, and is a British Tai Chi undefeated champion. In 1992 he founded Tai Chi UK and established the ZENON WUDANG TAI CHI CHUAN SCHOOL. In 1995 Sifu Jacques codified the teaching of Tai Chi creating a grading syllabus to enable teachers to be assessed according to their knowledge and practical comprehension of Tai Chi. He is also a Reiki spiritualist healer so incorporated this element back in to tai chi. He is often called upon to judge international competitions as well as attend seminars and give demonstrations on Tai Chi and personal development. Dan Docherty was born in Glasgow, Scotland, in 1954. He served as an inspector in the Royal Hong Kong Police Force from 1975 - 84. He began his training under Cheng Tin-hung in 1975. He has represented Hong Kong in Full-contact Fighting, in 1980 winning the Open Weight Division at the 5th South East Asian Chinese Pugilistic Championships in Malaysia. Cheng Tin-hung was born in the village of San Xiang in Guangdong Province in 1930. He learned Tai Chi Chuan from his uncle Cheng Wing-kwong initially and then from Qi Min-xuan. In 1950 Cheng Tin-hung became a full time Tai Chi Chuan instructor in Hong Kong at a time when many famous teachers were active in Hong Kong. The competition included Yang Sau-chung, Wu Kung-yi, Tung Ying-jie and Cheng Wing-kwong, his own uncle. He trained Full-contact fighters who more often than not smashed their hard style Kung-Fu opponents to defeat. He trained teachers to train teachers. He was known in his younger days as the Tai Chi Bodyguard because he would stand up for Tai Chi practitioners everywhere with fist or weapon. He has written four books on Tai Chi Chuan. Wudang Tai Chi Chuan was given its name by Cheng Tin-hung who never claimed to be teaching a particular style of Tai Chi Chuan. Chang San-feng lived on Wudang Mountain and the name Wudang was taken to acknowledge Chang San-feng's status as the founder of Tai Chi Chuan. 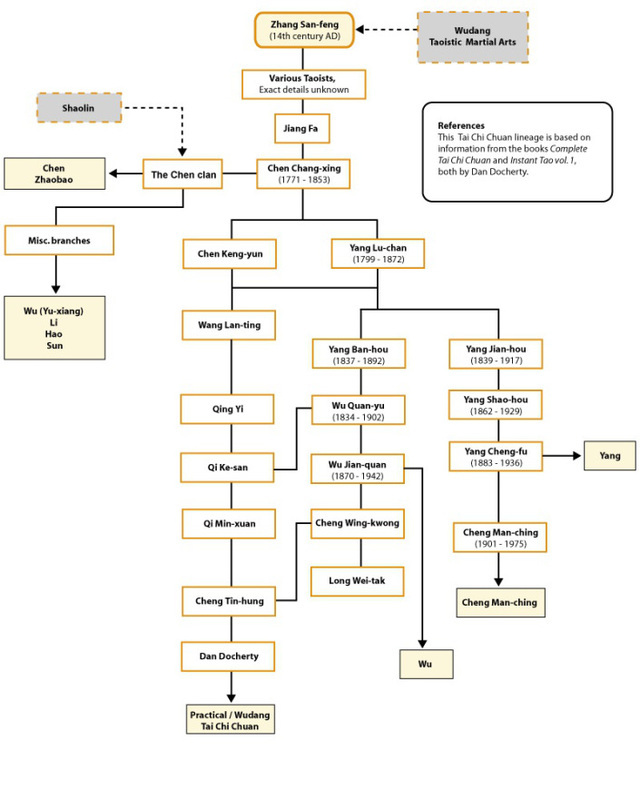 As you will see from the following lineage of the system there are links to the Chen, Wu and Yang family styles. Though it is perhaps most heavily influenced by the Yang Pan-hou and Quan Yu transmissions. Cheng Tin-hung first learned Tai Chi Chuan from his uncle, Cheng Wing-kwong, who was one of only three "inside the door" students of Wu Jian-chuan. His uncle taught widely in South East Asia, particularly in Malaysia. However, However, Chen Wing-kwon later brought Qi Min-xuan from Henan Province to teach his sons and nephews. Qi Min-xuan was from Wen County, Hebei Dao in Henean Province. He had adopted the Buddhist name of Zhi Meng, which means Sagacious Elder. Qi was originally taught by his father Qi Ke-san, but his main teacher was a Buddhist monk named Ching Yat (another Buddhist name, which means Pure One). Ching Yat had befriended the renegade sodier, Wang Lan-ting, who had (after killing some Manchus) been forced to flee to the temple where Ching Yat resided. Wang had learned from Chen Keng-yun, the son of Chen Chang-xing, and later from later from Yang Lu-chan. Apart from the fact that he was an officer in the Manchu Imperial Guard and the top student of Yang not much is known of Wang or who was taught by him.